Welcome to the morning show with Chris Cash.We are getting the Ozarks up and putting a smile on your face to start your day Monday through Friday 6 to 10 am. We bring you a live and local show to take care of all your information and entertainment needs. Weather, school closings, news, sports, funeral announcements, community events, a variety of guests, and of course the best country music along with our humor added into he mix. You can call in everyday from 9 to 10 am for the Swap Shop to buy, sell, trade, give away, or items you are searching for, and even share birthdays / anniversaries. Chris on the other hand always wanted to be on the radio all the way back to his early teen years. Now with more than 15 years behind the mic, he still wakes up everyday saying "cool I get to go to work!" You're sure to enjoy his friendly outgoing personality with his own dash of humor and old school values. Join Chris for a morning show like no other that will make you tune in daily just to hear what these 2 will be up to next! Chris Cash - Mornings the way it's supposed to be on Your Country 99. Listen in to Chris Cash EVERY Friday from 10:05-10:35 AM for the current list of Bargains! Monday thru Friday 9:00 a.m. - 10:00 a.m.
Join Chris Cash each morning for Swap Shop where listeners call in live an announce anything they are selling, looking for or wanting to trade. If you want to sing happy birthday to someone, announce an anniversary...have a lost pet, etc. Call in at 417-326-5257 for the Swap Shop program Monday thru Friday 9:00 a.m. to 10:00 a.m.
Join Chris and Carrie on Friday's from 10:05 - 10:30 AM for discounts on Lucas Oil Speedway Tickets, Hotel stays, Branson show tickets, area Restaurants, and much more. *Winning Bids must be picked up within one week. 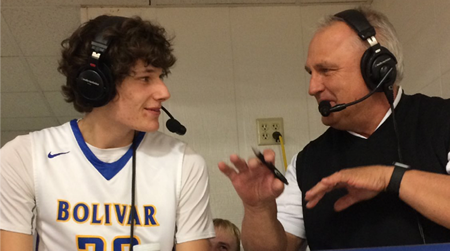 Bolivar Liberator's Play by Play action with Chuck Blair. Copyright 2016-2018. Benne Media. All rights reserved, worldwide.